With the growing use of mobile devices to connect with enterprise network and access business data, mere locking down of these devices is not enough. A centralized console is necessary to manage, control and secure all such endpoints. 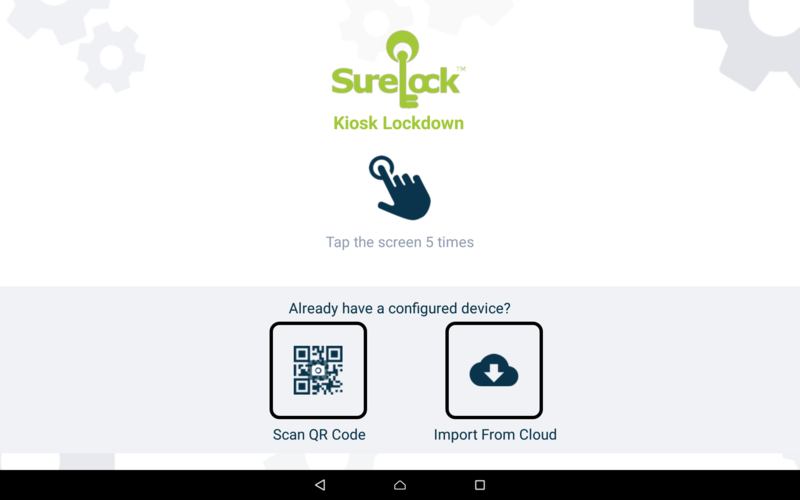 With the integration of lockdown solution like SureLock and advanced enterprise management solution like SureMDM, IT admins are enabled to not just lock down enterprise devices but also remotely manage these devices without compromising on workflow and security. 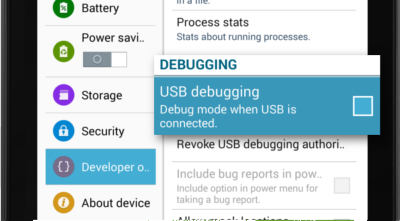 Using integrated SureMDM Nix Agent with SureLock is very simple and is available for all Android operating systems. 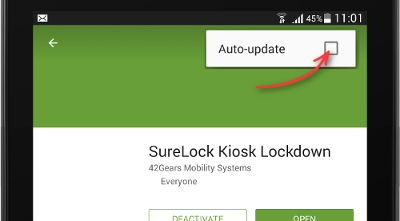 Install SureLock from the Google Play Store or 42Gears website and enable SureMDM Nix Agent from SureLock Admin Settings. How to enable SureMDM Nix Agent from SureLock Admin Settings? Steps to enable SureMDM Nix Agent from SureLock Admin Settings are given below. 2. 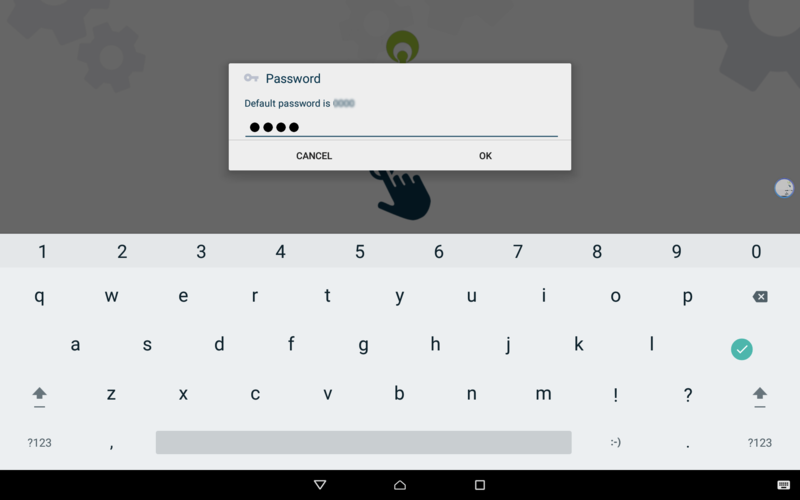 Launch SureLock password prompt by tapping on the screen 5 times within 3 seconds. 3. 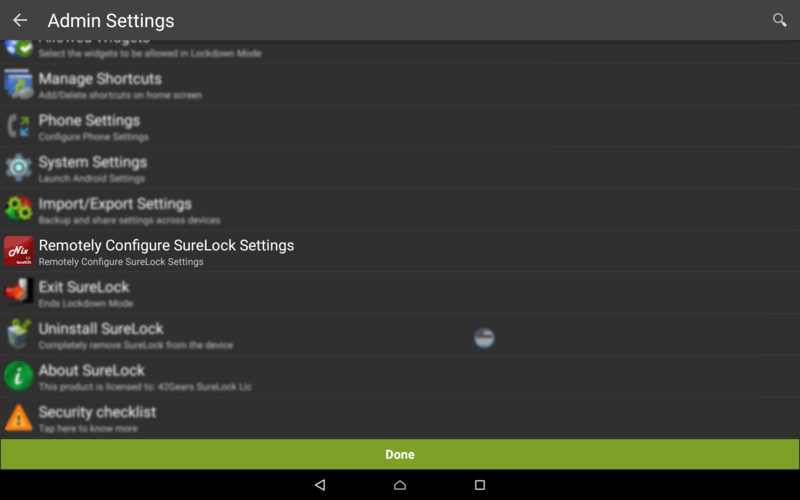 Enter SureLock Admin Password and tap on OK. Integrated SureMDM Nix Agent will be enabled. The user can now enroll the device to SureMDM Web Console for device management, lockdown and security service. Also, there is an additional feature where SureMDM trial account for 30 days will be created on free trial signup of SureLock. SureMDM account for 30 days will be created and the device will be automatically enrolled in trial SureMDM account. 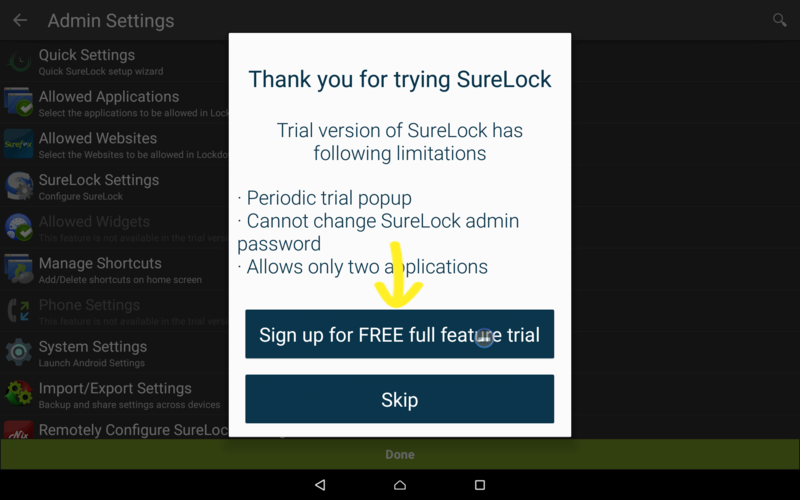 How to auto-enroll device to SureMDM while signing up for SureLock free trial? Steps for auto-enroll device to SureMDM while signing up for SureLock free trial using Free trial signup of SureLock option. 4. Tap on Sign up for FREE full feature trial option. 5. Enter Company Name, Email ID, Mobile Number, Country and tap on Submit. 6. An email will be sent for email verification. 7. Open registered Email and verify the account by clicking ‘Verify Now’ link. 8. After Email verification, use SureLock trial account for 7 days. Note: Users can also use Gmail, Facebook, LinkedIn account for Free Trial Signup.